Your tablet or phone could be harbouring potentially dangerous bugs. We explain how keep your tech clean without damaging it. We use them every day while eating lunch or a snack, but new Which? 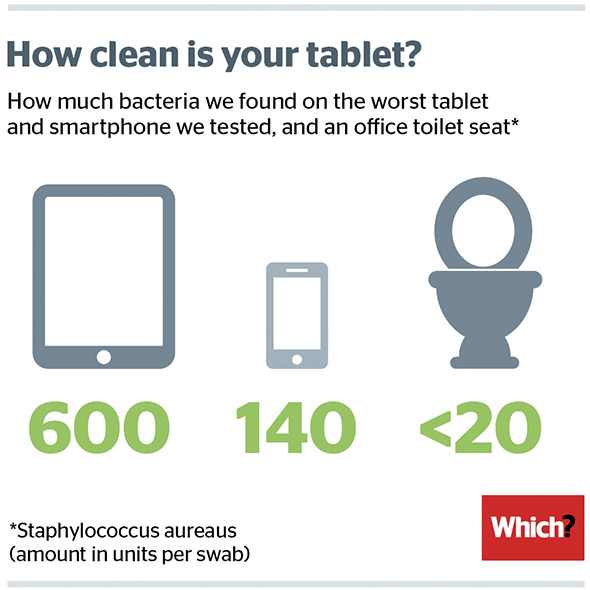 research has revealed tablets, smartphones and keyboards may have more bacteria lurking on them than an office toilet seat. If you haven’t cleaned your iPad in a while, you’ll want to find out how to safely eradicate hidden nasties that might be spread over your device’s surface. After swabbing 30 tablets, 30 phones and 30 office keyboards and sending, we received the stomach churning results you see above. On one particularly dirty tablet, we found a swab count of 600 units per swab for Staphylococcus aureus, which can cause a severe stomach bug. “A count of 600 on a plastic device of any sort is incredibly high,” says James Francis, the microbiologist who carried out our testing. Now you’ve seen our tablet-toilet seat comparison, there’s a strong chance you’ll want to give your iPad a scrub with a soapy sponge. Don’t do it – you’ll risk damaging your touchscreen device with water. Unplug any cables before you start cleaning. Use a damp, soft, lint-free cloth to wipe clean. Use a dry lint-free cloth to remove streaks and dry your phone. Avoid getting moisture in any openings or ports. Disinfect using specially-designed screen wipes. Apple advises against using alcohol-based cleaners on iPads or iPhones as these can damage the screen. Use a scratchy or abrasive material, as this would leave permanent marks on the screen. 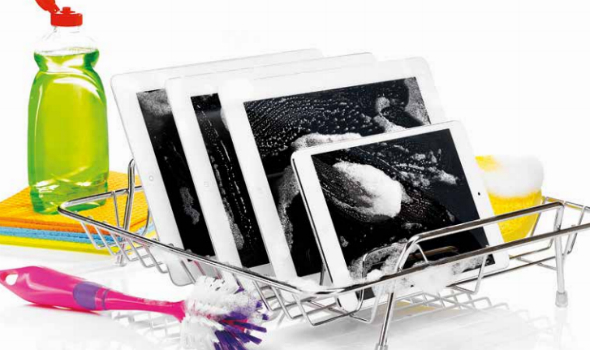 Use an aggressive detergent that could erode fragile surfaces on phone or tablet touchscreens. Use alcohol-based cleaners on iPads or iPhones, according to Apple’s advice for these products. Only rely on wiping your phone on a shirt sleeve or dry cloth.